Nice conditions out there this week which makes a change from the cyclones and bad weather that has hampered us the past few months! Fortunately the fish are still holding well in the usual spots and are in great condition! Sharks have been a major player on the outer pins, putting the Maxel/Jigstar combos to the test with exceptionally fast retrievals to land the fish before the taxman turns up! Bait fishing is a mixed bag as usual for this time of year. At times we have been able to load up at the wharf before the customers even turn up! 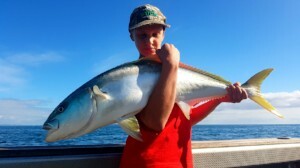 Other days see us motoring down the coast to find pockets of bait but overall, not too bad. 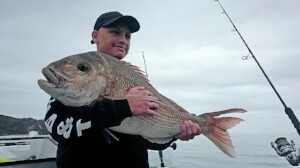 With the water temperature still warm, we are getting some nice Snapper as a bycatch mixed in with the Kingies! 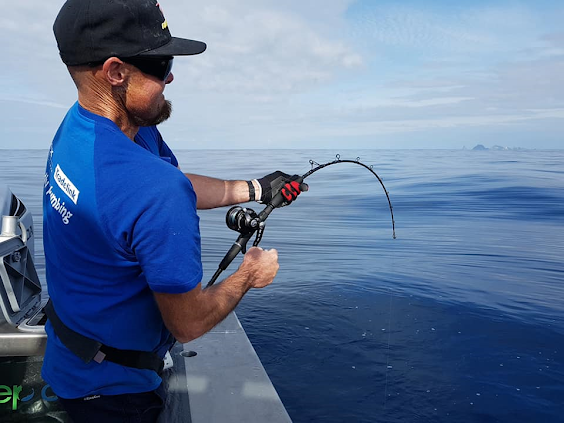 We expect the sharks to hang around for a while yet so be prepared to move around a bit and when you get a fish on, get your wind on!!! 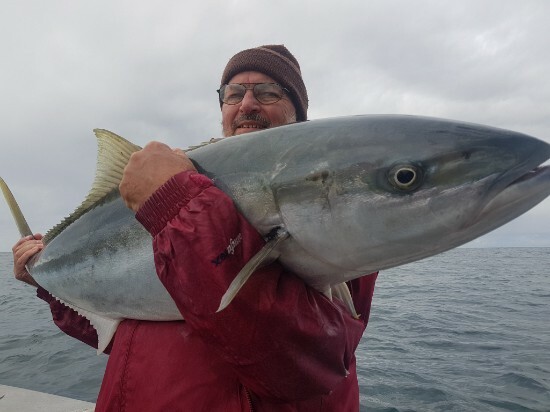 The weather has not been on our side in the last month which has held us up a bit with the fishing. 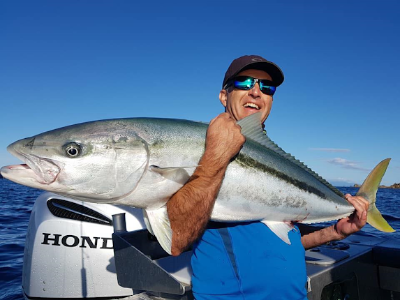 Bait fishing has been up and down, some days nice and easy at the wharf, and others have had us doing the miles! 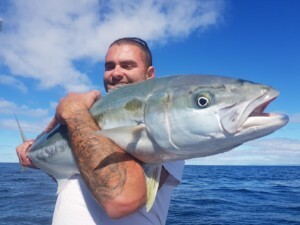 Of late, most of our king fishing has been in and around the islands producing plenty of awesomely conditioned fish. The dirty bronzies have been keeping us away from a lot of the deeper pins – from Cuvier through to the Aldermans, but hopefully as the water starts to cool down, we'll see the tax man bugger off! 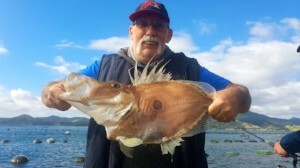 Snapper have been an easy and plentiful by-catch on the livies and dead baits most days, which makes for a tasty feed ! With a good lot of consecutive days on the water this month the fishing has been awesome yet again! 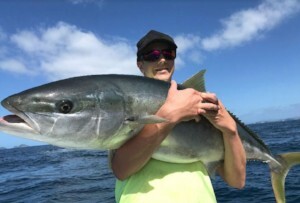 The bait has been a lot harder to find than just going in the bay and dropping the sabikis! 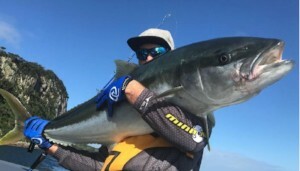 We have been either staying at the wharf and trying to fill the tank or venturing around the coast to a few other local spots that hold nice amounts of bait fish! A bit of burley and baiting the sabikis has been helping a lot! 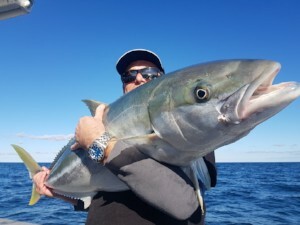 We have had some solid sessions on the kings lately whether we go north towards curvier or down towards the Aldermen’s, there has been consistent fishing most places. 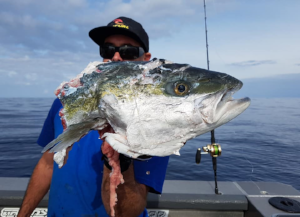 The sharks have still been around, does not seem quite as bad as last month but are still snatching the odd kingfish for a feed! 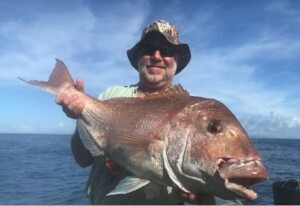 Snapper are still around and very hungry with a few nice fish coming in as well. 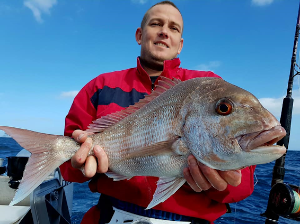 It is nice to be able to drop a few baits down where you are fishing for kings and grab a feed of snapper at the same time. Lets see how the next few months go as we head into winter! Well Summer has come to an end but fishing has fired up! This is the time of year when you can just drift around or anchor up anywhere and easily get your limit of decent sized Snapper. The Snapper are so hungry they are hitting anything you throw at them, and running a berley on the bottom has its benefits when out in the open. 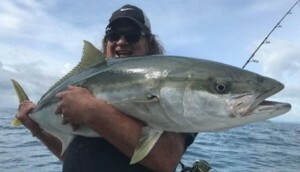 Kingies are in the best condition ive seen in years, and are still in big numbers in the Gulf. 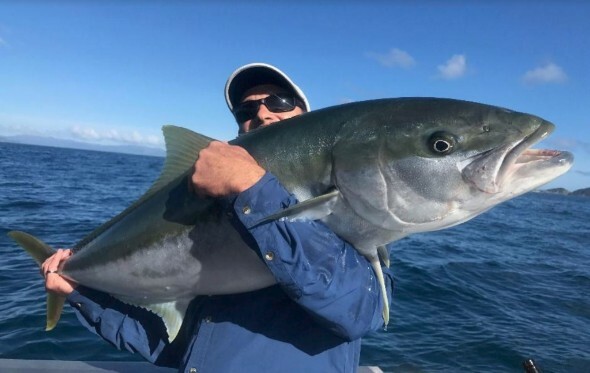 Channel Island has been on fire this summer getting some big kings and heaps of them. Also trolling the sunken rocks around the local islands outside Anglers Lodge has been epic coming into winter. 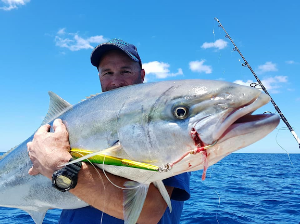 Kahawai are smashing everything, they put up a good fight but can be frustrating when trying to catch Snapper. 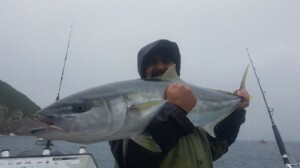 Bait fish are in abundance in close along the coast line south of Colville bay and around the farm out from Amodeo bay. 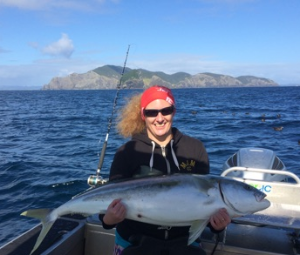 Fishing report from the Bay of Islands, for the Epic Adventures charter vessel, Koro King. Well autumn is here and the weather is still favourable. 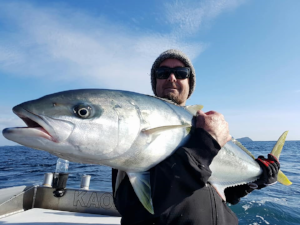 The baitfish are still readily available, xos mackerel and fat pilchards, perfect for our inshore target species, kingi, snapper, trevally ,kahawai etc. 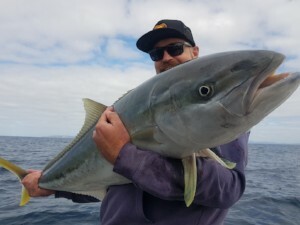 The hapuku, bass and the bluenose are making their way into shallower waters, winters looking good for the keen anglers. 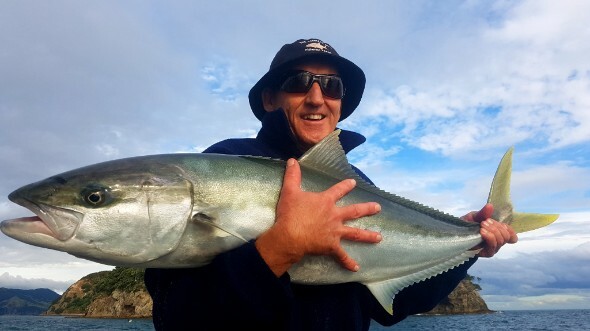 As a footnote the Bay of Islands Sword fish Club is again hosting the annual week long Light tackle tournament in early June, fishing for kingfish on 8 and 6kg line.Hosting numerous Australian teams along with some great Kiwi fishos, this is a must for the competent angler. 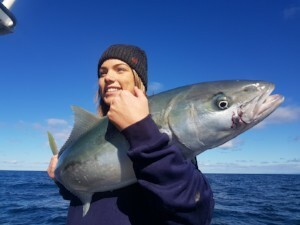 I have competed in the competition over numerous years, and boated some great kingis for both senior and junior anglers. Love to have you (and your mates) on board.